Ensuring the level of quality that our clients expect, and, of course, guaranteeing 100% the safety of our products, have always been the main goal of PERICHAN. 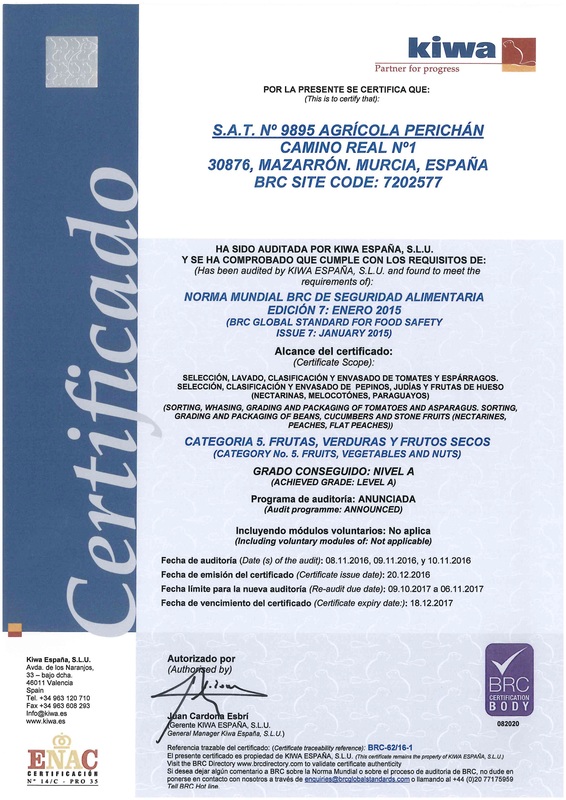 Therefore, we ensure our production and our processes beyond what the national and European legislation establishes, submitting our production and packaging processes to external audits (both in Spain and in Morocco), under the more demanding and recognized quality certifications at the international level. 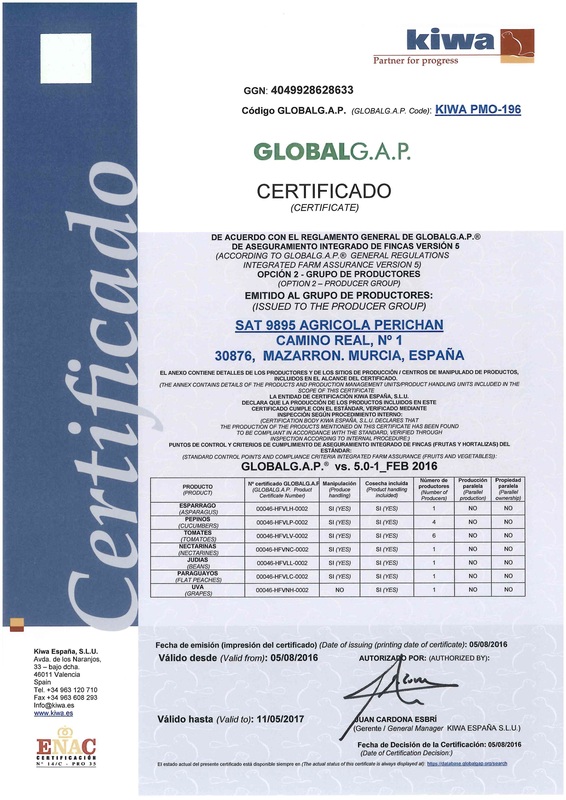 GLOBALGAP is a private entity that establishes voluntary regulations through which agricultural products may be certified throughout the world. The members of GLOBALGAP include retailers, producers and other members associated with agricultural activity. The GLOBALGAP regulation was designed primarily to give the consumer confidence about the way crops production is carried out: by promoting the Best Agricultural Practices worldwide, minimizing the damaging impact of the exploitation on the environment, reducing the use of chemical consumption and ensuring responsible conduct in the health and safety of the workers. This regulation is primarily focused on the control of the processes and conditions of selection, packing and storage of food products, ensuring the commitment to food safety and legality of the product, guaranteeing to the retailer the specified product under the compliance with legal requirements and covering the areas of quality, hygiene and safety of the product of the entire food industry. The certification in this regulation requires the adoption and application of a system of hazard analysis and critical control points (HACCP), an effective and documented system of quality management and the control of the environmental regulations for factories, products, processes and personnel. IFS is a Regulation developed by a wide international working group and promoted first by the HDE-Hauptverband des Desutschen Einzelhandels e. V. (German Retailers’ Federation) and the FCD-Fédération des entreprises du commerce et de la Distribution (French Federation of Retail and Distribution Companies), and, like the above, it is supported currently by a large number of distributors at the international level. With the implementation of this regulation we seek to offer the high degree of transparency that our clients require from us regarding the finished products and raw materials, so that we guarantee them that we are capable of supplying a safe product according to the specifications and to the current legislation. 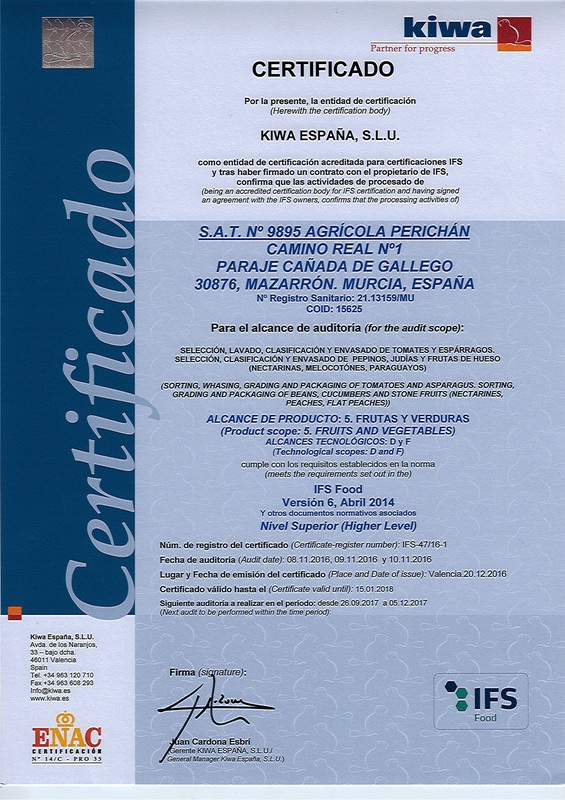 As a necessary complement to the compliance with the above certifications, PERICHAN has implemented throughout its entire production chain (from the field to the store) procedures through which we control and identify the product in all the stages of its production, registering all its processes, thus being capable of identifying the specific origin of each batch of our products, offering the consumer absolute confidence and tranquility with the foods that we produce. S.A.T. 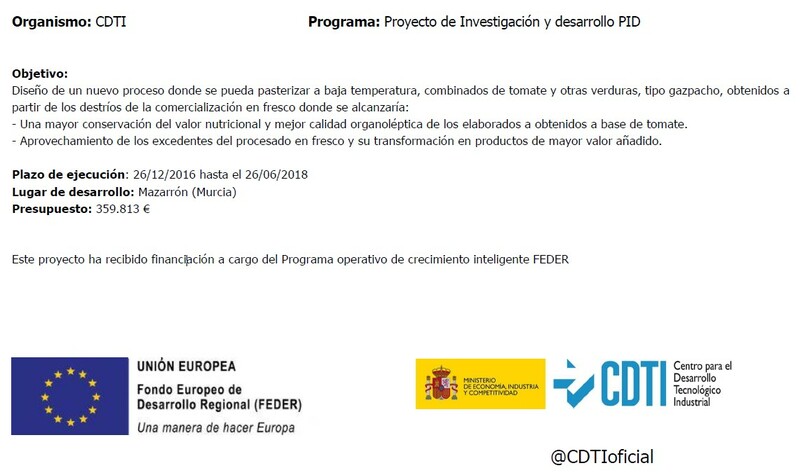 Agricola Perichán collaborates with the company Abiopep (Coordinator) and the group of plant pathology CEBAS in the project “NUEVAS TECNOLOGIAS PARA OBTENER RESISTENCIA PepMV EN TOMATE” which has been funded within the call RETOS COLABORACIÓN 2014 del MINECO. Ref . RTC- 2014-1577-2 . This project addresses obtaining PepMV resistance in tomato using different strategies, including cross-protection induced by resistance and obtaining genetic resistance by several complementary approaches including genome editing. In SAT N 9895 AGRICOLA PERICHAN SCP., Has carried out a research project on the recovery of medical waste. This project is funded by the Ministry of Economy and Competitiveness through the Operational Program for Intelligent Growth 2014-2020, a program supported by the European Regional Development Fund. SAT 9895 AGRICOLA PERICHAN forms part with other technological partners of the HORTGANIC Supraautonomic Operative Group, according to the Order of November 17, 2016 of MAPAMA. Group formed for the European association of companies seeking innovation in terms of productivity and agricultural sustainability. The objective of the FLEXINFOOD project is the creation of a new food manufacturing model and integration of the agri-food value chain, highly flexible, efficient, sustainable and quick to react to market changes through the generation of an integrated ecosystem of autonomous, adaptive and predictive digital technologies. All this starting from the understanding and quantification of the interaction of the own and singular factors that impact on the processes of supply, design and confection of agri-food products to the manufacture and distribution of food and to the quality and safety of the product. Given the scale and complexity of the problem, FLEXINFOOD will address the implementation of this new model and technological development in two main areas: flexibility in the process of creating new products and its connection to the supply chain and flexibility in the manufacturing process of the agri-food product. This project has been co-funded by CDTI and the European Regional Development Fund (ERDF) with the aim of promoting technological development, innovation and quality research.